The Adventures of an Intrepid Reader: Sunday Salon: I've got a lot on! Sunday Salon: I've got a lot on! Today I thought I would take the opportunity to talk about a few things that I have going on. This time of year seems to get very busy very easily online! First things first! Have you seen the awesome Shaun Tan blogiversary giveaway that I have going on at the moment? 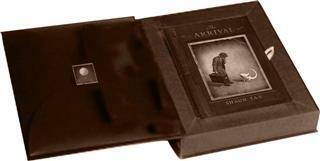 You can win a special boxed edition of The Arrival and Sketches from a Nameless Land that at this stage has only been released in Australia. To enter, check all the details here. Next up, South Pacific Book Chat. A few months ago, I mentioned in a Sunday Salon post a few months ago that Maree from Just Add Books and Tanabata from In Spring it is the Dawn were starting South Pacific Book Chat. There were lots of book chats on Twitter, but so often they were at inconvenient times for those of us who live in the South Pacific. So now, each week on Thursdays at 6pm JPN/8pm Eastern Aust/10pm NZ we come together and chat about all sorts of different things. Through #spbkchat I have met new book bloggers, and Tweeters, had a load of fun, and had some good book recs. Topics we have chatted about over the last few weeks include sports books, show us your TBR, spooky reads and more. Coming up this week we are focusing on Australian YA, so if you are on Twitter and would like to join in, then look out for the #spbkchat tag on Thursday nights. One project that I am a little behind on is the Australian Book Blogger Directory. We are still taking entries, and there has been some discussion about there being a Book Blogger meet up in Sydney next March. Keep an eye out for further news about that. It will be announced both at the directory and here, and a few other places as well. If I get organised, then I will try to organise one in Melbourne before then as well. I am planning to spend some time today putting new entries up. In the meantime, if you are an Australian Book Blogger and you would like to be added to the directory, then please head over to the Directory and leave your link. Tomorrow, I will be posting about the 2010 Virtual Advent Tour. This will be the fifth year I have co-hosted the tour with Kelly from The Written World, and we always look forward to seeing all the posts by the participants. I just saw the buttons for this year's tour and they are Gorg-e-ous! And finally, in a couple of weeks, we have a special week coming up at Historical Tapestry featuring one of my favourite authors, so I will be sure to tell you all about that when it happens! All this means that I have lots that I can be doing on this Sunday morning, and can be very productive without even leaving the chair. If only I didn't have to be doing some housework at the same time! What are you going to be doing this Sunday afternoon? Sundays are precious aren't they Marg. We took the new granddaughter (now 5 weeks) down to Victor Harbour to meet the great grandparents today. Now to catch up with the blogging world. I'm very excited to join the Advent Tour again! It has become one of my favourite blogging traditions. Also, I love that you guys have put together that directory. Alex at The Sleepless Reader and I have talked about making one for Europe a while ago. It would be pretty handy! So glad to have you on board again Ana! The directory is good, but it is a bit of work, especially if you get a bit behind. Should be better to manage now. You have been very busy lately. I love the spbkchat. Even with the time zone differences I like to tune in when I can. Great bunch of bloggers, readers, and tweeters. You've been busy! Saturdays and Sundays are precious. I was back home spending time with my family and celebrating my mom's birthday. Wow! You really do have a lot going on! I look forward to seeing your upcoming Advent posts as well! Alice, my family time will be next weekend. I am glad you love the Spbkchat Beth. I have a lot of fun with it!